I was feeling down and out and depressed after reading this and penning my previous post. But then just to show that there is still hope for reform, Rediff comes up with the feel-good news of the month. And the best picture of the year—-hands down. No this picture is not doctored. Nor is this BJP’s newly elected MP. I will let Rediff take over. The capital’s monkey menace shows no sign of abating. 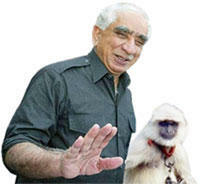 A few years ago, Jaswant Singh, foreign minister in the Vajpayee government, had taken the lead in hiring a langur at a princely sum of Rs 5,000 per month to ward off the simian terrors. Upon his shift to the finance ministry, the langur too shifted operations to the North Block. Since then, more ministries and departments have requisitioned the langur’s service. But it was a surprise last week when one saw a rather well-fed langur keeping watch over proceedings inside the Parliament House complex. Apparently, apes of the four-legged variety have often raided its august precincts, threatening both staff and the honorable members. The brief given to the langur and its keeper is to sterilise the complex before the start of the day’s proceedings so that no monkey business is witnessed during working hours. Meanwhile, noticing the langur-wallah’s presence, a leading MP couldn’t help remarking to a scribe, ‘Now, you can’t say we haven’t done anything for the aam aadmi’. Yes one more Pakistani plot involving monkeys belonging to the dreaded “Lashkar-e-Bandar” attacking Parliamentarians has been foiled by our own Captain Langur. Of course at 5000 a month, his services do not come cheap. But that is to be expected……..excellence and good looks come at a price. However, the problem of how to deal with the elected simians inside the House still remains unsolved. This is just insanely hilarious..almost as insane as me staying up at this un-godly hour reading your blogs!! :)..I dont go to other sites now, for news about India.I just stop by here! I think the North Block langur’s name is Ram Singh. Oh God this is just brilliant! Next The Rising—-Fact or Fiction?